The Epson XP-335 is a compact and wireless inkjet printer which is a good choice for a home or small office. It is a multifunction printer that can print, copy and scan. It is ideal for SOHO users only and not suitable for big offices as it has a limited capacity of paper handling. The Epson XP-335 printer has a control panel which is a 3.7cm in width and possesses a colour LCD screen that allows easy viewing of images before printing. Also function and navigation buttons are present. The printing and scanning resolution is high and offers standard network connectivity. A USB port and a memory card reader are provided along with the printer. It has a flatbed scanner along with the printer. But this printer can handle 100 sheets only at a time. The Epson XP-335 is designed for those looking for high-quality printing. It is a wireless inkjet printer which is a good choice for a home or small office. It saves space due to its compact small size and also it saves time due to its good printing speed. Only the Epson XP-335 Ink Cartridges that run out need to be replaced, hence it saves money too. But the problem with this printer is that double-sided printing can be done manually only and neither it has an option for optional paper trays nor does it have an automatic document feeder. How to check ink status of Epson XP-335 printer? You must always keep a check on the ink level of your Epson XP-335 ink cartridges as printing with low cartridges may damage your printer and can decrease the lifetime of various internal parts. How to check and clean the printheads using Control panel for Epson XP-335 printer? Q. I am planning to buy the Epson XP-335 printer. What can I expect to receive in the box? A. You can expect to receive Individual Ink Cartridges, Main unit, Power cable, Software (CD) and a setup guide in the box. Q. Can I print directly onto CDs and DVDs using the Epson XP-335 printer? A. Unfortunately, Epson XP-335 cannot be used to directly print onto CDs and DVDs. Q. What is the use of Epson Easy Photo Print? 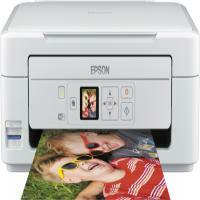 A. Epson Easy Photo Print is an application that allows you to easily print photos with various layouts. You can preview the photo image and adjust the images or position. You can also print photos with a frame. Q. My cyan ink cartridge has run out of ink. Do you offer any individual packs for Epson XP-335 ink cartridges? A. Yes, we have compatible individual packs for all the ink cartridges including the cyan colour cartridges compatible with Epson XP-335. Q. What operating systems does the Epson XP-335 printer support? In Windows OS, Windows XP x64 and higher. In Mac OS, Mac OS X 10.6.8 and higher. Q. How much time will it take to deliver Epson XP-335 ink cartridges if I order from Galway? A. All our orders are delivered by Fastway Couriers. Approximately 90% of our orders received before 12 noon daily are despatched same day and delivered on a 1 - 2 delivery day basis. Fastway couriers will deliver between the hours of 9am - 5pm (Monday - Friday). However, if your need is urgent, you can call us on 048 30833221. There are times when we are unable to keep our promise of 1-2 delivery due to a rural location or Fastway couriers’ network distribution. Q. Does the Epson XP-335 printer come with cartridges? A. Yes, Epson provides a set of Epson XP-335 ink cartridges with the Epson XP-335 printer. You can buy more ink cartridges when the starter ink cartridges run out. You can find a range of Epson XP-335 ink cartridges on our website. Q. Will this printer fits in my small space? A. The Stylish and compact XP-335's small and lightweight design means it doesn't take up much valuable desk space and is a good choice for a home or small office purpose. Q. How to replace the Epson XP-335 ink cartridges? When get prompt to replace ink cartridges, Check which cartridge needs to be replaced, and then press the OK button. Select Replace now option using the up or down button, and then press OK. When replacing Epson XP-335 ink cartridges before they are expended, Enter Setup using the left or right arrow key, and then press the OK button. Select the Maintenance tab and Ink Cartridge Replacement using the left or right button, and then press the OK button. When replacing the black ink cartridge, gently shake the new black ink cartridge four to five times and then remove it from its package. When replacing the colour ones, remove them from their package without shaking. Open the scanner unit with the document cover closed. Squeeze the tab on the ink cartridge and pull it straight up. If you cannot remove the ink cartridge, pull it firmly. Insert the new ink cartridge, and then press it down firmly. Press the x button. Ink charging starts. Q. Will my privacy remain protected, if I order for the Epson XP-335 ink cartridges from this site? A. Wholesale Ink Ltd is committed to ensuring that your privacy will remain protected. Any information you are asked to provide in this website, we assure you that it will only be used in accordance with its privacy statement. We may ask for your personal details during payment so that we can provide you with the best possible service. We assure you that we will not share your details with any third party. Q. Will the warranty I have on my Epson XP-335 printer become null if I use compatible Epson XP-335 ink cartridges (EPSON 29XL)? I know Epson guys prefer that their customers buy original ink cartridges? A. It’s highly unlikely, if not impossible for the warranty on your Epson XP-335 printer to lapse should there be a problem with it. Compatible EPSON ink cartridges are as good as their original counterparts in every way. Q. I happened to switch off Epson XP-335 printer accidently while changing Epson XP-335 ink cartridges. Though I completed the procedure, the printer isn’t working; I can’t take any printouts. What should I do now? A. Please ensure that you never turn off your printer at the time of replacing the ink cartridge. Switching it off midway is likely to cause damage to the ink system, hindrances in getting printouts, print quality, printhead ink leakage issues, etc. For now, check the print head nozzles to see if they have dried. Refer to your manual or contact Epson Support for further assistance. Q. How many pages can I print in black if I use compatible Epson XP-335 ink cartridges? Is it less than how much original cartridges yield? And how much black ink is provided along with the ink cartridge? A. You can print 470 pages with black ink with this ink cartridge. Original ink cartridges also print 470 pages, so you aren’t at a loss; in fact, you save a considerable amount of money when you buy compatible ink cartridges as they are cheaper. You get 11.3ml black ink with the black ink cartridge. Q. I haven’t used my Epson XP-335 printer for several months as I was out of town. I need to get back to work now but since the printer’s been idle, should I begin with cleaning the printhead before taking further steps? A. Yes, please perform the head cleaning operation of your printer and also since it wasn’t in use for long. Q. Can I know if the shelf life of Epson ink cartridges exceeds one year? Q. What are some of the basic things that I can do to maintain our Epson XP-335 printer so it’s always in good shape? A. Please clean the heads of your printer regularly and also check its nozzles every week to make sure its ink doesn't get clogged and you know if something needs to be addressed. Q. Is it necessary to shake new Epson XP-335 ink cartridges only before opening the packages? A. Yes, you need to shake the ink cartridges for four or five times gently before opening the packages. If they are shaken after the packages are opened, ink may start leaking. A. You need to install the new Epson XP-335 ink cartridges immediately after removing the old ones from the printer. If you don’t do that, the print head may dry out and will be incapable of printing. Q. Can I remove Epson XP-335 ink cartridges for later use and keep it handy? I have to travel abroad for a few weeks . A. Yes, you can remove your ink cartridge and use them later. You need to take care that you cover its ink supply area properly so it remains free of dust. Also, store the ink cartridge in the same environment as the printer. Q. What is the best way to store ink cartridges while they are not in use? I need to store them in bulk sometimes. A. Ink cartridges should ideally be stored with their labels facing up.